Now or Never – Life in itself is enough – it needs no goal. “Now or never” can sound like a scary ultimatum. Don’t we feel more comfortable when life is planned, when we know what our goal is? What is the goal of life? Why is there a desire to continue to live forever? “There is no goal of life, for the simple reason that life is its own goal. The goal is intrinsic, not something outside; not there, far away, but herenow, in this very moment. “The very idea of goal is future-oriented. “The moment you start living for a goal you stop living in the present, in the immediate. The goal becomes more important. Tomorrow becomes more important, and you have to sacrifice today for tomorrow; and the trouble is, tomorrow never comes, has never come, is not going to come ever. “But you go on sacrificing your today – which is your only treasure, which is all that you have got. “You risk that which you have for that which is only a mind desire. “But the society, culture, civilization, religions – they have all conditioned the mind of human beings to live for ideals, goals, to go on sacrificing the real for some imaginary paradise, future life, eternity, God. All these names mean only one thing: Don’t live now. “All the cultures and all the civilizations and all the religions are against the ‘now’ – and now is the only reality. “Wherever you are, whenever you are, it is always now. Except ‘now’ there is nothing existential. “The word goal is very dangerous. It is suicidal to have a goal. Without your awareness you are being sacrificed for something which is never going to happen. “Life in itself is enough – it needs no goals. “That’s why there is this urge, this desire, this tremendous lust to live and to live forever. It has nothing to do with you; it is your very life. This is not being taught to you; you are born with this desire. This desire is your gift from existence itself. “If you listen to this desire and if you stop listening to all kinds of religious nonsense, you will be a new man, really alive. “Yes, life has a tremendous power, and it wants to expand. It wants to live as intensely and totally as possible. 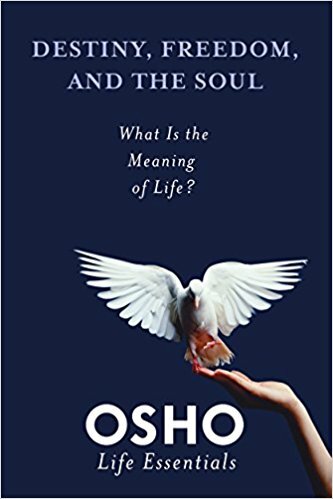 Suggested reading: OSHO: Destiny, Freedom, and the Soul: What Is the Meaning of Life?